One of my coworkers sent me this story this week: The Poet Laureate of Fan Fiction. As usual, I’m always the last to hear interesting news. In this case, it’s the story of poetry used to inspire Wincest and Johnlock fanfic. Now, I believe in my fellow slashers’ ability to read slash into anything, because I do the same thing. There’s a Byron poem or two that I’m convinced tell the story of Remus/Sirius pretty damn well. But this is the first time I’ve ever read about a poet not only acknowledging this interpretation but apparently having fun with it. Richard Siken has some things to say about it. 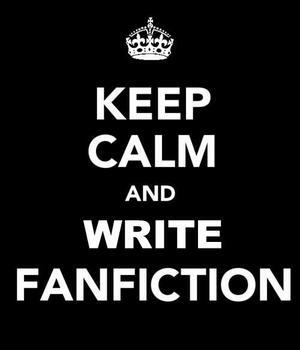 I really enjoy seeing literary discussions of fanfiction, but those discussions never seem to discuss slashfic. So I found this discussion especially fascinating. There’s a lot in here that makes you think about the nature of fanfic, which I think is lovely and healthy, even if I don’t agree with all of it. And maybe I have some more slash fanfic to write in my future? What am I saying? Of course I do. These were also made for me in a swap. 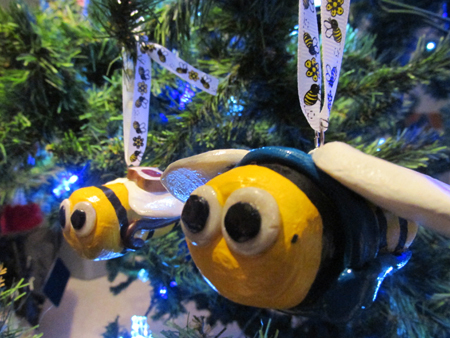 Sherlock Holmes has a thing for bees, so this Sherlock!bee and Watson!bee are one-of-a-kind. Sherlock!bee has on his blue scarf, while Watson!bee has his cane and some toast with jam! 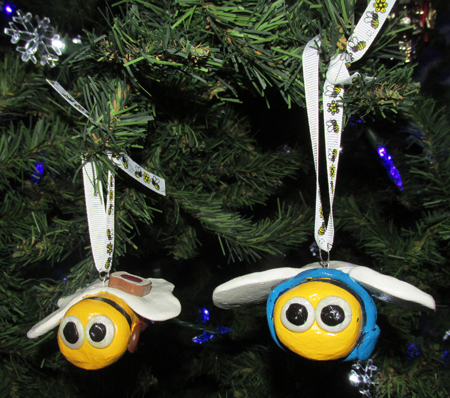 The hangers are both ribbons with bees on them as well. They’re absolutely adorable! My swap partner in a Sherlock swap mentioned liking stuffies. 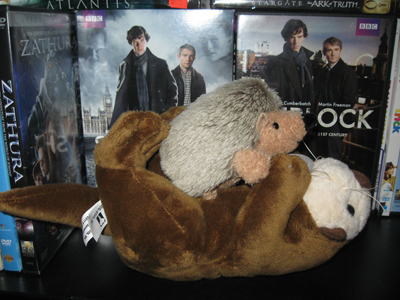 And I was getting a little tired of making Sirius stuffies and Baskerville hound stuffies. 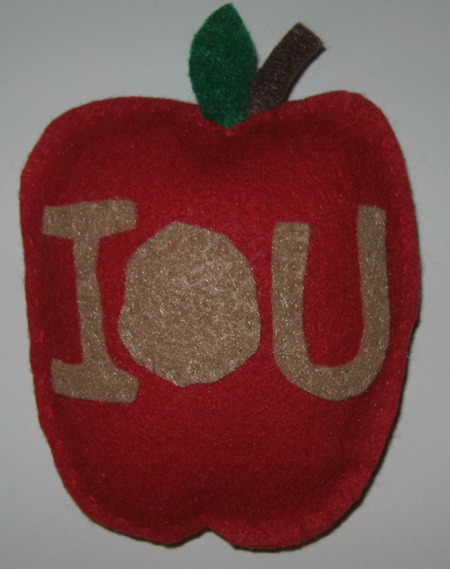 I thought to make this into a stuffie a while back, but never had a reason. This was it! I feel like the letters are a little more squished than they should be, but otherwise it came out rather nicely and it was fun to make! 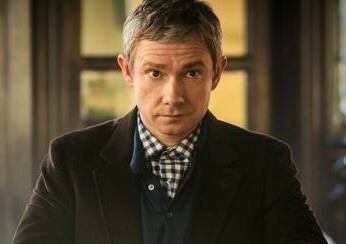 Quiz: Which Sherlock Character Are You? You have an unusual yin-yang: you balance a normal life devoted to helping people with a surprising yearning for danger and difficulty. You seek out people who are suffering, and do your best to help them, and you are the self-appointed protector of your close circle of family and friends. Basically quiet and reserved, you rely on that circle to provide you with both steady, reliable love and companionship and regular walks on the wild side. Thoughts: Awww. I can’t say I’m sad about this. I was actually expecting to get Molly Hooper, so I’m frankly surprise as well as thrilled. Except Danger and I are pretty much strangers. But I hope that I’m there for my friends the way John is for his. My friends definitely draw me out though, so there is that. I just haven’t helped diffuse any bombs lately. If half the time I spend pinning things on Pinterest were spent actually making/doing the things I’m pinning, my craft room would be STUNNING. Now, someone, go find me a door knocker that looks like Sherlock’s and I’ll be all set. Benedict Cumberbatch seems to be everywhere these days, and I’m not complaining. I first took notice of him in BBC Sherlock, where he amazed me with his acting skills. He’s got a distinctive look and certainly a distinctive name. But then I realized he was in Atonement. I’d seen that. So I guess that was the first time. Such a creepy, wonderful role. 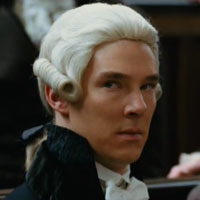 But that had to be it; even though I didn’t know he was him, that was the first time I saw Benedict in anything. Then I saw War Horse. I made it almost to the end before I realized Benedict was supposed to have been in it. How in the world had I missed him? That look, that voice. 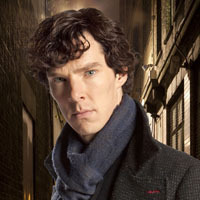 I’d seen all of BBC Sherlock multiple times; how had I missed Benedict. He’s not the main character, but his role isn’t even a small one. I ended up watching the movie over again, feeling embarrassed and foolish for not noticing it was Benedict to begin with. How does someone so distinctive blend into a movie like that? Cate Blanchett, I understand; she’s like a master of transfiguration. But Benedict? Last night, I watched Amazing Grace. Despite having bought the DVD the second it was out, I hadn’t watched it since the movie theaters. I love the movie, and Ioan Gruffudd is amazing in it. Plus, there’s Rufus Sewell, Michael Gambon, and Albert Finney; it’s a great cast, and a great look at a part of abolition that (as an American) I’d been unaware of. The second the movie started, I practically screamed. 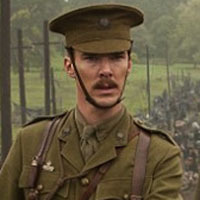 Benedict Cumberbatch was in the movie? Seriously? I checked the DVD case. He isn’t mentioned ANYWHERE on it, not by picture or by name. He doesn’t even play a tertiary character in the movie–he plays William Pitt, one of the main characters’ best friends and the PRIME MINISTER OF ENGLAND. He just wasn’t “known” back when the movie came out the way he is now and so they didn’t bother to mention him on the DVD case or in the posters. Which is a shame, because he’s fantastic in it. 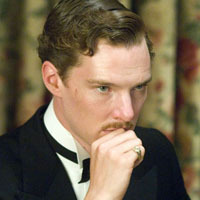 And it was a delight to watch the movie again, now knowing Benedict for the great actor he is. The movie still made me feel inspired and made me cry. So that had to be it. The first time I met Benedict Cumberbatch in a movie and he just hadn’t stuck in my mind. But, just to be sure, I checked IMDB. Tipping the Velvet? He was in Tipping the Velvet? As Freddy?! I’ve seen Tipping the Velvet far too many times to count, and I hadn’t noticed him? Luckily, there is Youtube. So that was it. Tipping the Velvet. That was my first time seeing him in something.